Can a dental negligence claim still be made if the dentist providing the treatment has since retired? The Dental Complaints Service, who looks into complaints about private dental services provided by dental practices in the UK, has reported a 17% increase in complaints compared to the year May 2011 and April 2012. The increase in complaints against dentist is something that our Dental Negligence Team can relate to. However, more frequently the Dental Negligence Team is currently seeing a high proportion of cases, where clients have received negligent treatment at the hands of a retired dentist. The Dental Negligence team are seeing a trend of cases where patients have attended a new dentist due to their dentist retiring. The retiring dentist has not reported any problems when the patient has attended their six monthly check-up. Upon the dentist retiring and the patient attending a new dentist, issues such as periodontal disease (gum disease) and tooth decay have quickly been identified that should have been picked up sooner. For further information on gum disease, read our blog “Dental Negligence and delayed diagnosis and treatment of periodontal disease”. The General Dental Council (GDC) who regulate dentist and dental professionals in the UK, struck off a dentist who later retired for providing treatment to a number of patients which fell below the standards reasonably to be expected of a registered dental practitioner. The treatment ranged from providing crown and bridgework that had multiple defective margins which resulted in, or were likely to result in, decay; failing to provide any oral hygiene or dietary advice and failing to take or retain appropriate radiographs of sufficient diagnostic quality to enable appropriate treatment to be given. WHAT SHOULD PATIENTS DO IN THESE CIRCUMSTANCES? Many clients who enquire about a potential claim after being advised of poor treatment by a new dentist are unsure whether they are able to make a claim against a dentist who has retired. However, patients who find themselves in this situation should not be deterred or worried and a claim can still be made. By law, all dentists must be registered with the GDC and must have appropriate indemnity and insurance arrangements in place in order for patients to seek compensation which they may be entitled to. Therefore even after a dentist retires they will still be responsible for the treatment which was carried out when they were practising as a dentist. The Dental Negligence Team has significant experience in bringing claims against retired dentists and understands how to trace these dentists and ensure their indemnity insurers are notified and respond to potential claims, which is vital for the claim to succeed. 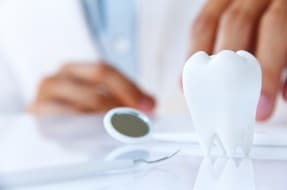 Our team has experience in all of these aspects and would recommend that for those who have concerns about their dental treatment to seek specialist legal advice to ensure the treatment is investigated.